There’s an open water aquatic park in Bucerías that offers a new alternative for family fun. Wibit, the latest trend in adventure aquatic parks, has arrived in the Riviera Nayarit, specifically to the beach in Bucerías. This new attraction consists of the installation of a series of inflatables in different shapes that together make up a fun circuit that gets the adrenaline pumping. 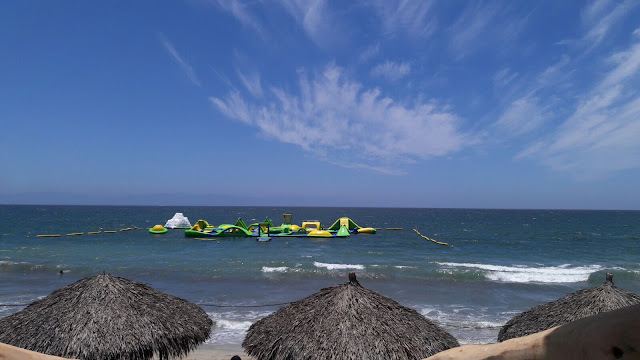 Bucerías is the perfect spot for this open water park thanks to its location on the Banderas Bay, which means small waves, light currents, an ample bed of sand and a solid service infrastructure. Bouncy houses, slides, rope towers, bridges, domes, curves, walkways, half tubes and much, much more are part of the fun. Children aged four and up are allowed in the park as long as they know how to swim and they must wear floating equipment or lifejackets. To complement Wibit’s own safety conditions and trained personnel, the area where the park was installed also coincides with a lifeguard tower manned by the Department of Public Safety. The price is $350 pesos per hour, per person, or $700 pesos for the full day. Groups of over 10 people receive a 20% discount. There are other discounts for residents of Bucerías and Nuevo Vallarta who have a photo ID. The park is open from 10 a.m. to 7 p.m. The main offices are located on Avenida del Pacífico #15 (entrance is through Breakers Beach Club). For more information call 01 (329) 298 1298. Please visit the website at www.wibitmex.com for the Facebook fan page at https://www.facebook.com/Wibit-Mex-1859830204258312/.